When working with your online Flip Channel folders, you might decide to create new folders to share specific content with specific groups of friends and family members. Items that you copy to your My Channel folder are for your eyes only. 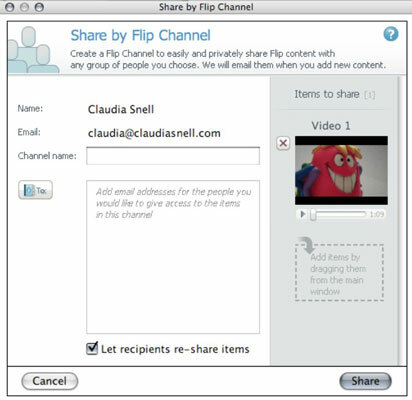 To share your creations with others, you create a new Flip Channel folder by adding the items you want to share and inviting others to access the items by supplying the e-mail address for each person you want to share the items with. Click any item(s) in the workspace area that you want to share and then click the “Add New Channel” icon button to the right of the “Sent Flip Channels” folder in the Navigation pane. The “Share by Flip Channel” window appears and displays your selected item (or items) in the right column. On the left, your name and e-mail address is already filled in. Add: Drag and drop items from the workspace window to add those items to your e-mail. Delete: Click the red X in the left corner next to items you want to delete. Type a name for your new channel in the Channel Name field. Then click the To field and enter the e-mail address for the person you want to share your selected item with. You can enter more than one e-mail address. Just separate each address with a comma. You can also fill this field from addresses in your Address Book. Click the To icon button to open an Address Book window to display any e-mail addresses stored there. Select the check box next to the e-mail address (or addresses) you want to send your e-mail to and then click the Add To button. The Address Book window closes and your selected recipients are added to the To field. If you don’t want the people you share your items with to share the items with others, clear the “Let Recipients Re-share Items” check box. Leaving this check box selected allows people to share your items by inviting others to view your creations. The “Share by Flip Channel” window closes, and a progress bar appears in the Progress box as FlipShare processes your request. An “Items Updated” message appears to let you know when FlipShare has successfully uploaded your item (or items) to your Flip Channel.